Since Pew Research Center conducted its first Global Attitudes survey in 2002, we have explored how the world sees the United States. This year’s survey finds negative reactions around much of the world to Donald Trump’s presidency, and major changes in ratings for the U.S. Here are nine charts that highlight international perceptions of Trump. 1Globally, Trump is much less popular than his predecessor. Across 37 countries we surveyed in spring 2017, a median of just 22% said they have confidence in Trump to do the right thing in world affairs. In contrast, 64% expressed confidence in President Barack Obama in these same 37 nations during the final years of his presidency. 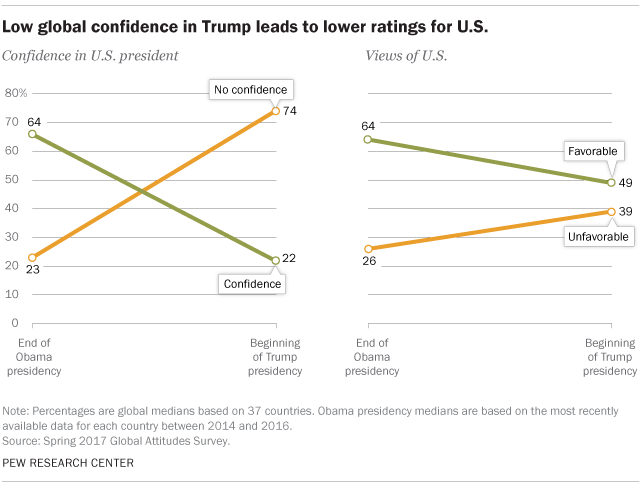 And this shift in American leadership has clearly had an impact on how the world sees the U.S.: A median of 49% now give the U.S. a favorable rating, down from 64% in the Obama era. 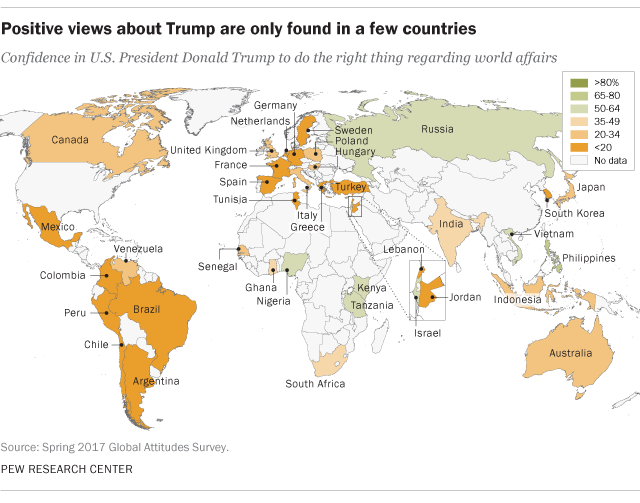 2Only a few countries have positive views of Trump. In just eight of the 37 nations in the study, roughly half or more say they have confidence in Trump to do the right thing in world affairs. The president gets his best reviews in the Philippines, where 69% express trust in him (although this is down from the 94% Obama registered in 2015). Trump also gets mostly positive ratings in sub-Saharan Africa, as did both Obama and former President George W. Bush. Russia, Israel and Vietnam also have confidence in Trump’s ability to handle international relations. 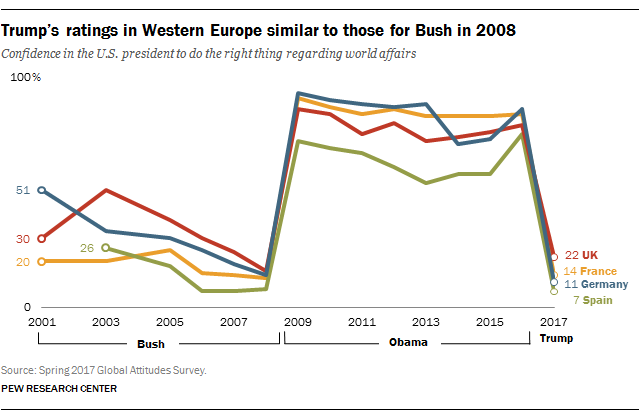 3Trump’s ratings in Western Europe look a lot like Bush’s at the end of his tenure. While Obama was very popular in Western Europe, his presidency was bookended by two very unpopular Republican presidents. Major elements of George W. Bush’s foreign policies met with widespread opposition in the region, and by the time he left office, his ratings in countries like the United Kingdom, Germany, France and Spain were quite low. Today, Trump gets similar marks as Bush in these four nations. 4 Europeans who favor right-wing parties are generally more likely to have confidence in Trump. Those with a favorable view of right-wing parties in France, the UK, Italy, the Netherlands, Sweden and Germany tend to express more confidence in Trump. For example, in France, 39% of people with a positive view of Marine Le Pen’s National Front party have confidence in the U.S. president, compared with just 6% among those who have an unfavorable opinion of the National Front. Still, even among those who like right-wing parties, confidence in Trump is limited, and there is no Western European country in which a majority of right-wing party supporters offer a positive assessment of the American president’s leadership in world affairs. 5 Trump gets more negative ratings globally than Merkel, Xi or Putin. German Chancellor Angela Merkel is the only world leader included in the survey who receives more positive than negative reviews. Across the 37 nations polled, a median of 42% express confidence in her, while 31% say they lack confidence. Ratings for Chinese President Xi Jinping and Russian President Vladimir Putin are mostly negative, and Trump receives even more unfavorable assessments than both of them. 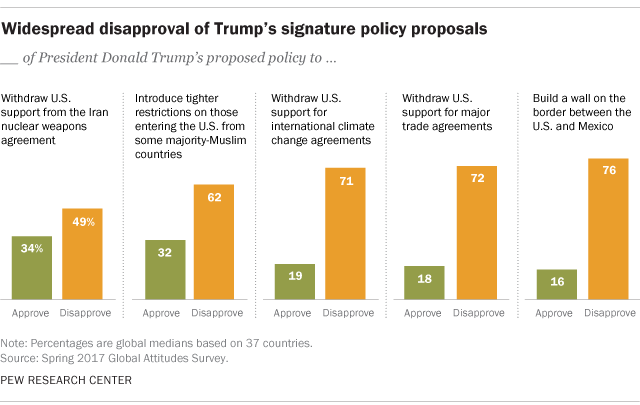 6Global publics oppose some of Trump’s major policies. We tested five of Trump’s major national security and foreign policy proposals – withdrawing from the Iran nuclear deal, placing tighter restrictions on people entering the U.S. from certain majority-Muslim nations, pulling out of international climate change agreements, withdrawing from trade deals and building a wall on the Mexican border – and with a few exceptions, they meet with broad disapproval around the world. 7 Most say Trump is arrogant, intolerant and dangerous, but a majority also sees him as a strong leader. Survey respondents were read a list of positive and negative characteristics and asked whether each one describes Trump. 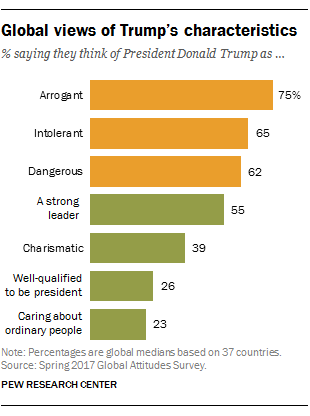 Around the globe, people tend to associate the American leader with all of the negative characteristics tested: Most say he is arrogant, intolerant and dangerous, while relatively few think of him as well-qualified or as someone who cares about ordinary people. Describing Trump as charismatic is more common, though global publics on balance do not think of him as charismatic, either. They do, however, see Trump as a strong leader – a median of 55% across the nations polled describe him this way. 8 Trump gets his lowest ratings in Mexico. Over the past decade, U.S. presidents have gotten mixed or negative reviews in Mexico, but at 5%, Trump registers the lowest confidence rating of any U.S. leader in Mexico since Pew Research Center began surveying there. His rating in Mexico is also the lowest among the 37 nations polled in 2017. The proposed border wall between the U.S. and Mexico has been a high-profile position for Trump since he declared his candidacy for president, and more than nine-in-ten Mexicans oppose it. 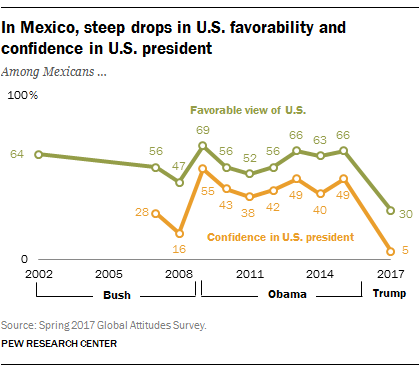 U.S. favorability has typically been higher than confidence in the American president in Mexico, and that remains the case this year – though the share of the public with a positive view of the U.S. has dropped steeply since 2015. 9 Russians give Trump higher marks than they gave Obama or Bush. Amid ongoing controversies and investigations into allegations of links between the Trump presidential campaign and Russia, attitudes toward the U.S. and its president have turned more positive in Russia. Following the outbreak of the Ukraine crisis in 2014, Russians’ ratings for both the U.S. as a country and for Obama plummeted. However, since 2015 – the last time the Center polled in Russia – favorable opinions of the U.S. have become much more common, and Trump gets better reviews in Russia than either of his predecessors ever did.